The French people love to sing at Christmas! Chants de Noël (Christmas Carols) from France may be found in most English-language hymnals. You may have sung the playful “Il est né le devin enfant” (“He Is Born”, The United Methodist Hymnal, No 228) with its delightful inclusion of “oboe and bagpipes.” See the following link for a discussion of this hymn: "History of Hymns: French carol “He Is Born” celebrates joyous season." This carol recalls the long wait of the prophets and invites the singers to join a lively shepherd folk band at the manger. “Les anges dans nos campagnes” (“Angels We Have Heard on High”, The United Methodist Hymnal, No. 238) contains one of the few Latin phrases still sung by many congregations: Gloria in excelsis Deo (“Glory to God in the highest,” Luke 2:14). Technically, this is a macaronic carol because it uses two languages – the local vernacular and Latin. The total focus of this carol is on the shepherds’ visit to the manger at the invitation of the angelic chorus on perhaps the longest melismatic passage (many notes on a single syllable) that congregations sing: Glo – o – o – o – o – o – o – o – o – o – o – o – o – o – o – o – ria! In music, usually the more notes a composer ascribes to a single word or syllable indicate that it is very important or carries much emotion. These two carols along with “Un flambeau Jeannette Isabelle” (“Bring a torch Jeannette Isabella”) and “Sing we now of Christmas” are the most popular of many in the French tradition available in the English-speaking world. The famous “O Holy Night,” translated into English in the nineteenth century, is originally a French carol, Chantique de Noël. 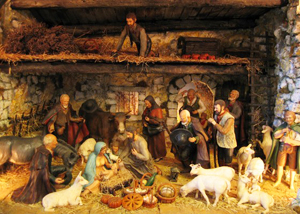 “Sing we now of Christmas” is a perfect song to accompany the French tradition of the crèche. 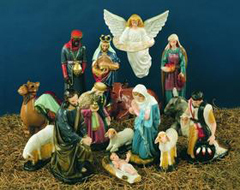 Handmade nativity scenes are not only common in homes, but also in town squares. Little clay figures, traditionally made in the south of France, are called “santons” (“little saints”). Fine craftsmanship characterizes the production of these figures, and they are a source of local pride for the communities that produce them. It is interesting that “crèche” is also the French term for nursery for young children during the day. Christmas trees, though not absent from France, are more of a German tradition, as the traditional folksong “O Tannenbaum” (“O Christmas Tree”) attests. The crèche, on the other hand, is the more common focal point for the season in France. This tradition is particularly strong in Provence, the south of France, with a crèche that includes the Holy Family, the Magi, the shepherds, and the animals, along with additional local figures, such as the mayor, the little drummer boy, or a peasant, dressed in traditional attire. In some villages, people dress as the shepherds and join in a procession to the church. Children often contribute to domestic crèches by bringing small stones, moss, and evergreens to complete the scene. Then, everyone sings carols! Perhaps this tradition explains the focus of many chants de noël. They are often sung around the crèche in homes or in procession to the church, dressed as shepherds. Rather than viewing the scene, it seems that the singer actually joins the biblical characters as a part of the scene. Rather than the focus on the Christmas tree with a manger scene placed in some adjacent location, the focus is on the crèche itself and those persons that make up the nativity ensemble. This idea is an outgrowth of the French Renaissance when humanity assumed an important role in cosmic events. En trente jours Noël fut accompli. [Christmas in thirty days was accomplished. Noël nouvelet, a new Noël sing we. How my heart did glow, with inward joy divine! Some English singing translations preserve the reference to the “Lamb” – usually in the diminutive form “lambkin” (sometimes “Lambkin”), the latter which obscures the reference to the Infant Jesus as the Incarnate Lamb of God, rather than to a literal lamb in the field. As is usually the case, singing translations lose much of the original imagery. What appears to be a simple retelling of the Christmas narrative finds its roots in the culture and domestic pageantry of its day. The birth of Christ represents a spiritual awakening, a deeper connection between God and humanity. May Christmas spring anew in your life – Noël nouvelet!